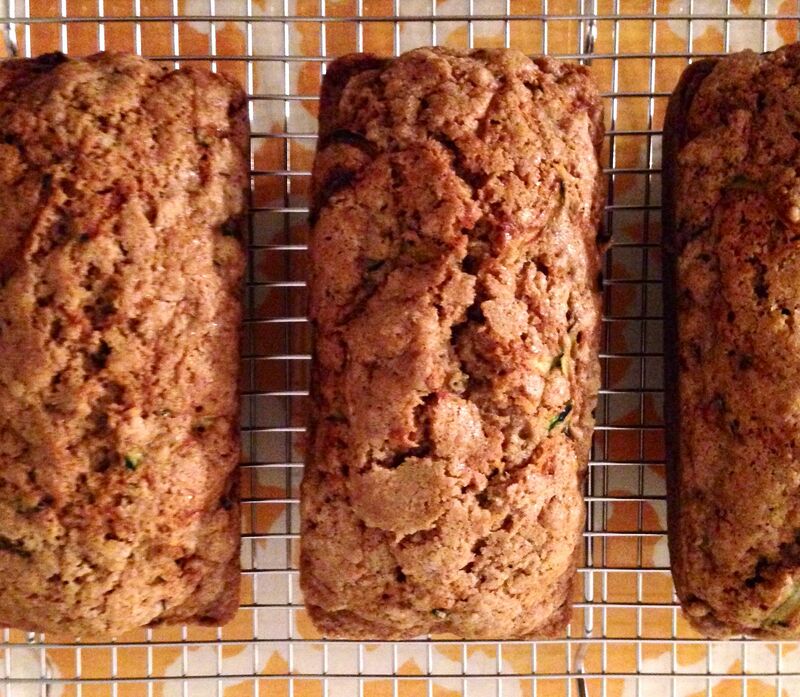 Well, it’s August, so that must mean it’s zucchini bread time. To me, it just wouldn’t be summer without this recipe. My mom made it when I was a kid, and every year I bake it to much acclaim from Dave and Rosa. (In fact, today Rosa had a friend over while I was baking. She literally asked, “What is that wonderful smell?”) We eat it warm out of the oven or spread with peanut butter for breakfast. I will probably make several batches throughout the month and will freeze some for later in the year when we desperately need a taste of summer. Nearly every time I make this recipe I tinker with it a bit. Sometimes I use canola oil, sometimes olive. I might play with different flours, and I almost always trim the amount of sugar. Like most quick breads this batter also bakes up beautifully as muffins. I even included a version in the breakfast chapter of Real Baby Food as Zucchini and Carrot Donuts. Did I mention this recipe is also really easy? There are no special tricks here, just measuring, stirring, and summoning your will power to wait until the bread is just warm before cutting a slice. 1. Preheat the oven to 350 degrees. Spray four small loaf pans (or one large or 12-18 muffin cups depending on how big you like your muffins) with non-stick cooking spray. 2. In a large bowl whisk together the flours, sugar, salt, baking powder, cinnamon, and nutmeg. In a small bowl whisk together the eggs, canola oil, and vanilla. Stir the wet ingredients into the dry ingredients until they’re just combined. Stir in the grated zucchini. 4. Cool in the pan(s) for 10 minutes before turning out an a wire rack to cool completely. To freeze, wrap tightly in aluminum foil and place in a zip-top bag. Do you have any favorite summer recipes you make year after year?